Rendering of the future La Rue Road Bridge. This spring, construction will begin on the La Rue Road Bridge replacement. 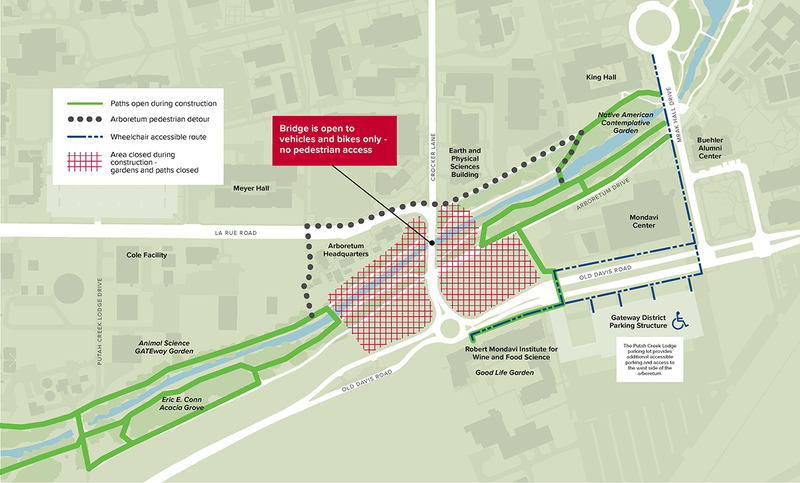 The new bridge will safely accommodate the increasing number of cars, bikes and pedestrians now traveling to and from the campus’s expanding Gateway District. This project – majority-funded by the Federal Highway Administration – replaces the current 32 foot-wide, almost 70-year-old bridge with a 52-foot-wide span that meets current seismic standards. Additionally, this project involves the relocation of critical utility lines and multiple improvements to the Arboretum. Throughout construction, both lanes of traffic will remain open to cars and bikes and — and, in a change of plan, the sidewalks will be off-limits. Check back here for detour map. The affected areas of the Arboretum below the bridge include portions of the California Foothill Collection, the Warren G. Roberts Redbud Collection and parts of the Conifer Collection. Detours will be in place here throughout construction which may last upwards of 14 months. The good news is that the project brings new landscape and hardscape features to the Arboretum, upgraded irrigation, the construction of accessible pathways and the inclusion of bridge features designed specifically to delight Arboretum visitors. Also, note that our horticulturists will work closely with the contractor to ensure that the trees, plants and wildlife in this area receive proper care and protection. Detour map. Click here to download a larger .pdf.